Both Panasonic and Canon announced their first water- and shock-proof compact toughcams earlier this year, and we've taken them underwater for a test. Which is better for capturing your summertime antics both wet AND wild? The antidote to Canon&apos;s blimpy D10 is Pansonic&apos;s comparatively skinny Lumix TS1. Let me say first that I did not use either of these cameras in their ideal conditions—namely, outside, underwater while swimming. For some reason, Canon and Panasonic did not tailor the release dates of these cameras to coincide with my trip to Egypt a few months ago, which is where I wanted to test them out (why not guys??). Back here in New York, any outdoor body of water is way too frigid right now, and there's something pretty creepy and ultimately unacceptable about taking an underwater camera to the YMCA for test shots. So, instead of the verdant coral reefs of the Red Sea off the Sinai coast, which were straight out of Planet Earth, our test shots are of me playing with a Kraken Attackin' Lego Pirates playset in my kitchen sink. Which is a cool playset, but, you know, not the same. The D10 looks like it was designed by Ringo on the set of Yellow Submarine—its bulbous shell and porthole-like screws drive home the fact that this baby is going underwater. But on land, it'll be tough to fit it into a pants pocket without some serious bulging. It does have some nice, easy-to-press buttons for changing into video mode, for instance, and the icons on the LCD screen are nice and big, easily spotted through a snorkeling mask. There are some superfluous button presses to lock in settings which could be tedious underwater, but the UI is not horrible, and you'll easily get used to it. The D10 also has come big screw-mounts on each corner for mounting various underwater grips and other accessories that you can buy from Canon. The TS1 takes a totally different approach, with a sleek rectangular slab shape that at first glance is hard to distinguish from regular non-tough weeniecams. The buttons are a bit smaller, but not prohibitively so, and shootings modes are selected with a thumb dial instead of dedicated buttons—I didn't see anything I couldn't operate with a bit of practice while snorkeling. A basic locking wrist-strap comes in the box. The important thing is that the TS1 is not at all out of place in non-toughcam situations, where the D10 may be. But if you're a deep snorkeler, three meters may not be enough for you compared to the D10's 10 meters (I imagine if you're a serious SCUBA diver, you'll need something beefier than either of these), but where you lose usability under water with the TS1 you will gain it on land. Consider that. Another big difference, if not the biggest, is that the Panasonic TS1 shoots 720p in the AVCHD format, where the Canon only does 640x480 VGA vids. The TS1 video recording mode isn't the most polished—there's a good two to three second delay from when you hit the dedicated video button to when recording actually starts and stops, and it's unclear exactly when everything does start, but if you're OK with that, the HD video mode is awesome. I mean, underwater HD in such a tiny package—that's a no-brainer right? I would kill to have some HD clips of my friends and I swimming around in crazy schools of neon fish in Egypt. Note: There is a current bug with the TS1 that makes video imported into iMovie '08 and '09 play at double speed. I had to do some conversion to avoid this, which is a pain. Panasonic says they're working with Apple on this to include a fix in future versions of iMovie. Keep in mind that the AVCHD format is kind of annoying, in that you might have to install special codecs and import video straight into your video editing software of choice and then export it in friendlier formats, rather than just grabbing an AVI or MOV clip from the memory card and uploading it to YouTube. And yeah, the quality of these videos is pretty bad, but the difference in the actual output is clear: 720p underwater rules. Both cameras are 12-megapixels, for full-res shots at 4000x3000. Both have the same size CCD sensor, but the TS1's ISO goes up to 6400 where the Canon D10's only to 1600. I didn't do a thorough sensitivity test with either camera, but I would imagine you don't want to go much higher than 800 on either one, so the difference is probably fairly moot. A difference that does matter is the TS1's wider-angle lens: it's a 28mm-128mm f/3.3-f/5.9 effective focal length zoom, compared to the D10's 35mm-105mm f/2.8-f/4.9. As you can see, color reproduction via the TS1's Leica lens is far better than the D10s, which has to fight through a bit more protective plastic. Also, the TS1 tends to autofocus underwater with much greater ease—important, because you won't always be able to look at the LCD when composing shots while snorkeling. 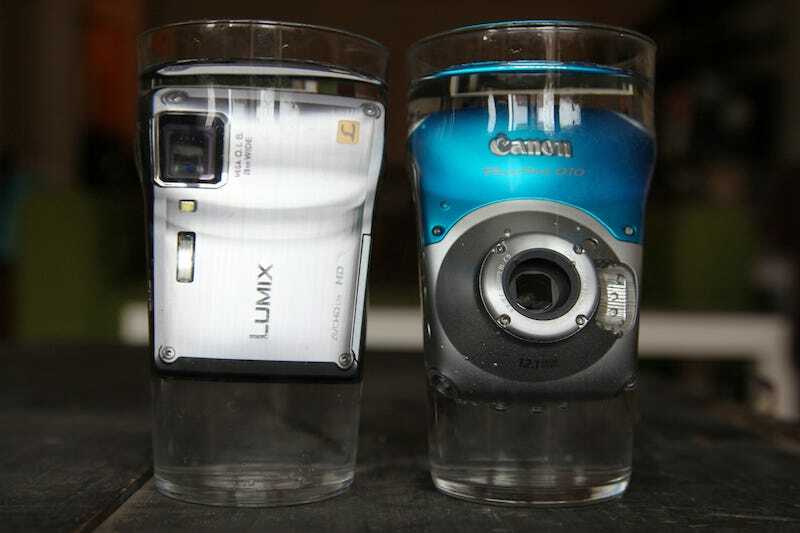 Like I said, I only played with these cameras in the sink, so I didn't push their waterproof capabilities to their max. But having a waterproof and shockproof camera around the house is kind of cool in its own right—imagine taking bath time photos of your kid without having to worry about getting the camera wet, or taking shots with dirty hands while you're barbecuing, or anything like that. You can always dunk these cameras underwater to clean them off. It's nice. You don't have to be a snorkeler to use them and have fun with them. Which is why for me, the balance shifts heavily toward the Panasonic TS1. Its form factor makes using it on land a lot more convenient, and the added HD video option is a huge plus. And my ears hurt if I go down much further than three meters underwater anyway. At a premium of only $70 ($400 list vs. $330 for the D10), I'd say it's well worth spending up for.